Over the years, we’ve worked with many schools who need to build transcripts to be sent to colleges and other institutions. The QuickSchools Transcripts module is very similar to our Report Cards module, in that you can very easily configure existing templates to suit your needs. And if our existing templates don’t quite fit your needs, we can certainly build new templates as well. How do you award credit (by quarter, or semester, or year)? Credit is often times awarded independently of the grades that appear in your report cards. For example, you may have report cards with 4 quarters, but if credits are awarded yearly, the transcripts will only show a single end-of-year grade. And if credit is awarded for every semester, then the transcripts will only show grades for each semester (and not for each quarter). Colleges typically are not interested in how semester or yearly grades are calculated from quarterly grades. In the example above, credits are awarded every semester. The report cards on the other hand may have 2 semester or 4 quarters per year. How do you calculate grades for each subject (average quarterly final grades)? In general, semester grades are simply the average of quarter grades, and yearly grades are simply averages of all the academic terms. But if your final grades require the inclusion of specific final exams, then that will need to be factored in. Or if your grade is a running total for the entire year (i.e. a single gradebook for the entire year with no averages), that would need to be factored in as well. Please come chat with us with specific on how to set up your transcripts, if it’s not a simple average. How do you calculate Grade Point Average (GPA)? 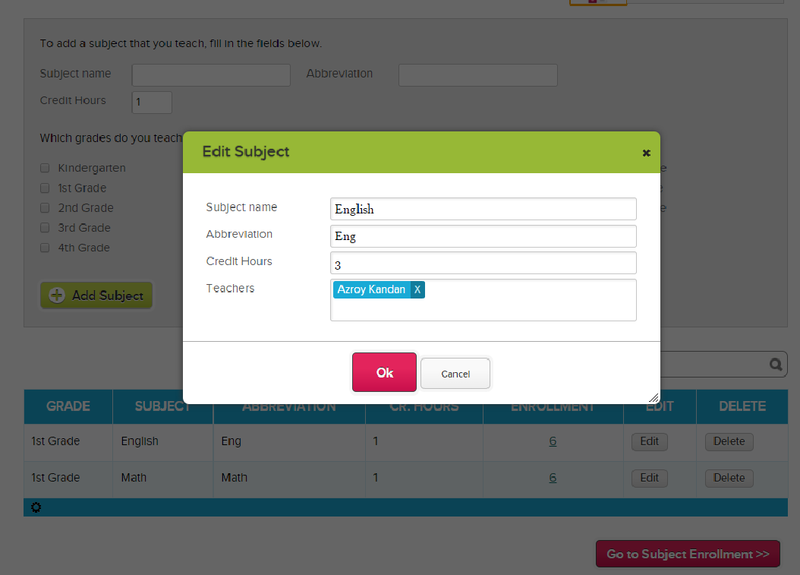 Out of the box, QuickSchools follows the standard calculation of Grade Point Averages. Each letter grade is assigned Points (A is 4 points, B is 3 points, and so on), and each subject is assigned a number of credits. Courses are weighted by credits, and then renormalized by total number of credits. You can change the mapping of Letter Grade to Points via the “Transcripts” > “Transcript Configuration” screen. If your GPA calculation is different from the standard norm, we can still accommodate custom GPA calculations via a custom Transcripts template. Standard Customization Rates apply. Please come chat with us on how to get this done. Do you want to show Weighted GPA for Honors and Advanced Placement? 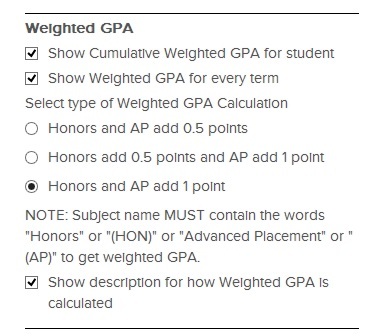 In additional to the Standard GPA, we also offer Weighted GPAs where subjects bearing “Honors” or “Advanced Placements” in their name are weighted slightly higher (usually half a point, or a whole point) from standard GPA calculations. These can be configured on the transcripts template, and are based on the schools we’ve worked with so far. 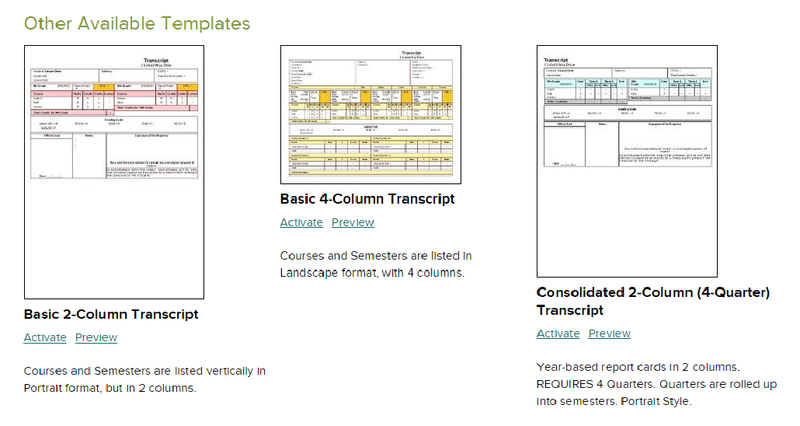 If your calculations are different, please contact us on how to can customize your Transcript template. Do you want to display grades for all grade levels or just for specific grade levels (like High School only)? By default, the Transcripts will show all grade levels that you track in your QuickSchools account. But you can configure your transcripts to only show specific grade levels (especially if you are a K-12 school, and only want to produce transcripts for your High School). You can control which grade levels to include in your Transcripts via the “Transcripts” > “Transcript Configuration” page. Do you want to show grades that are in progress? 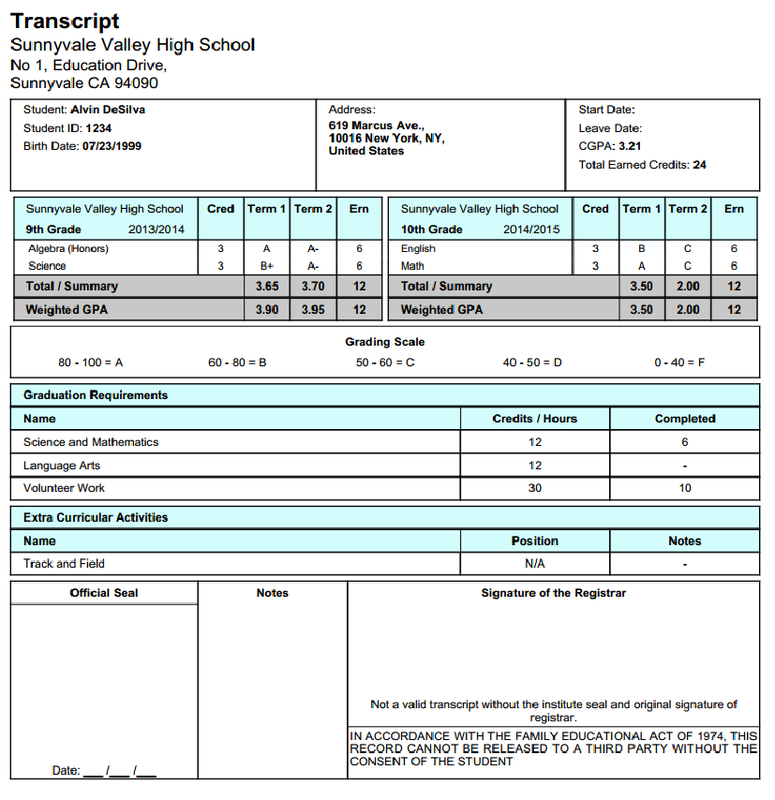 The transcripts typically pick up the final grades from the gradebook when calculating grades. However, if the semester is in progress, the transcripts may show transient data (i.e. grades from the current academic term is in progress and thus not official). If you need to produce transcripts right away and would like to exclude grades from the current academic year, you can opt to hide all grades that are in progress via the “Transcripts” > “Transcript Configuration” page. Do you want to display additional sections / areas (like Graduation Requirements)? 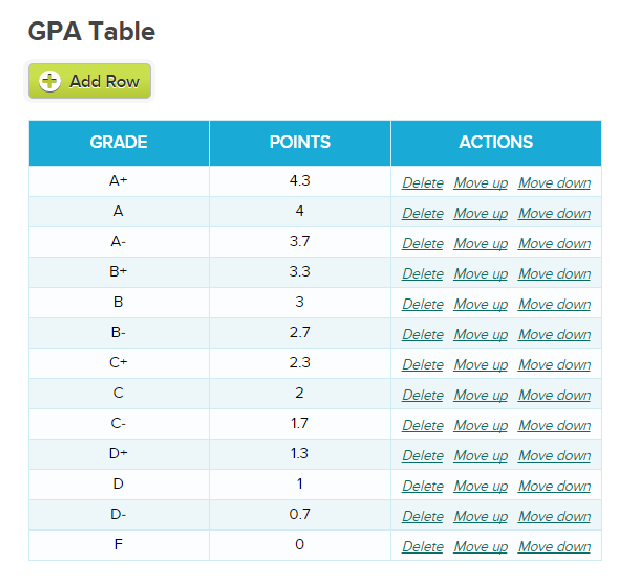 So far, we’ve only talked about grades, how to configure the way grades are displayed. If you want to add additional sections for things like Graduation Requirements, that’s certainly possible. But current public templates only support up to 2 additional sections. If you need more than the current limit, come chat with us for a customized transcript template. Please remember that our Transcripts are quite robust, just like our Report Cards. New templates can be created fairly easily, including custom calculations. If you need something very specific, please come chat with us to see what we can do for you.